From page One I felt like I was back with old friends the type where you can pick straight up from where you left off. But as you were getting comfortable you are introduced to Dr Alex Thorne which makes you go to the edge of your seat. Alex is Smart, clever and above all EVIL to the core. I cannot remember when I hated a book character so much, which is a credit to Angela Marsons writing ability, Angela has said she had fun writing this character and I understand a heck of a lot of research. 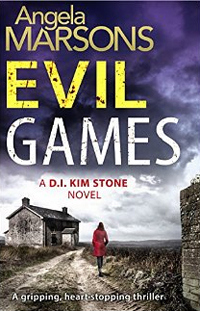 There is a lot more character development with D I Kim Stone you get to see her more as a person and not just the front she puts on as a Detective Inspector. Once again an amazing, breathtaking, twisty and exhilarating novel by a cracking writer.